ST. PETERSBURG, Florida- Who says Florida tourism is dead? 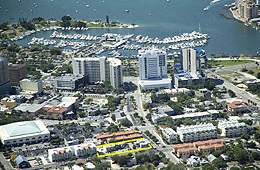 Believing that the west coast of Florida will continue to be a magnet drawing visitors from around the globe, Bison Financial Group arranged a bridge loan used to acquire a future development site in prime downtown Sarasota, Florida. The loan facilitated the assemblage of multiple parcels into a larger tract ideal for a 150 to 200-key hotel to be branded by one of the world’s leading hospitality companies. Once terms were agreed upon the loan for $3.7 million funded 14 days later. With the near shutdown of the capital markets the founders of Bison, David Repka and his brother, Jared Repka, have built a reputation for closing complex real estate deals by being able to clearly define a borrowers needs and match them with the right lender to provide a positive outcome for all parties. Bison is an advisor to a network of local, regional, national and international real estate entrepreneurs that buy, renovate and develop properties in Florida and select markets nationwide. The principals of Bison have high level, long-term relationships with stable sources of debt, mezzanine and equity capital. Bison arranges capital for development, construction, value-added situations and stabilized income producing properties.